The ferocious Battle of Stalingrad saw individual soldiers, armies, leaders and ideologies locked together in a savage war of attrition. 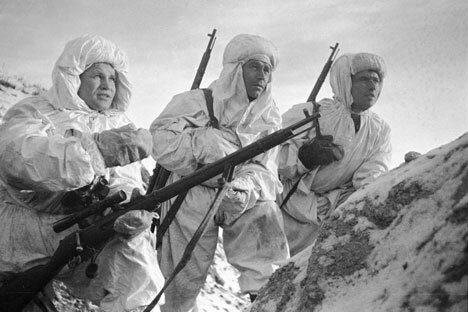 Snipers such as Vasily Zaitsev boosted the Soviet soldiers’ morale in their superhuman defense of Stalingrad. With a relentlessness that mirrored a battle which had begun four months earlier and had brought the German advance into the Soviet Union to a grinding halt, the message was repeated throughout the day. As temperatures dropped to minus 25C, encircled by an ever more confident Red Army, with their supplies and weapons rapidly diminishing, the same troops who had victoriously goosestepped down the Champs Élysées in Paris fewer than 30 months earlier were now on the brink of utter collapse. A day that many had speculated would see them victorious, perhaps even safely returned to Germany, had become instead the stuff of their darkest nightmares. Just over a month later, on February 3, 1943, Paulus (promoted a few days earlier by Hitler to Field Marshal on the assumption that he would commit suicide rather than become the first German soldier of that rank to be taken alive) signed the surrender. Like the battle itself, the defeat was one of epic proportions. Two entire German armies, 22 generals and more than 90,000 men along with what remained of the Italian, Hungarian and Romanian forces were taken prisoner. Of these, only 6,000 would ever see their homeland again. The Russian victory at Stalingrad, as well as being the pivotal moment in the Second World War, also reflected the incredible renaissance of the Red Army, which, riven by Stalin’s purges and morale-sapping defeats, had for 18 months seemed to have little answer to the Wehrmacht’s might. Bolstered by the rallying cry, “There is no land for us beyond the Volga,” and a ruthless discipline enforced by the fearsome NKVD, which executed 13,500 of its own side at Stalingrad alone, the Red Army found a new cohesion and purpose born out of a blend of patriotism, desperation and fear. Symbolic of this resurrection was the story of Stalingrad’s most celebrated hero, the accountant-turned-sniper, Vasily Zaitsev. He landed in Stalingrad on September 22, 1942 and within a week – seven times the average life expectancy of Soviet reinforcements arriving in the city – he was in his grave. Zaitsev grew up in the Urals, where his grandfather taught him to hunt and shoot. He was drafted into an infantry unit but was made a sniper when a brigadier saw him shoot three German machine gunners in quick succession. Temporarily blinded by shrapnel in January 1943, he was invalided out of Stalingrad, but returned to the front in Germany, finishing the war as a captain. He settled in Kiev, where he ran a textile factory. He died in the Ukraine in 1991 and was buried there. But in 2006 he was reinterred, according to his wishes under the Mamayev Kurgan, epicentre of the battle of Stalingrad, with full military honours. According to his memoir, Notes of a Russian Sniper, Zaitsev, in a deep post-battle sleep, had been dumped in a pit along with the newly dead. When he awoke, he managed to dig himself out of his tomb, and promptly killed two German machine gunners close by with grenades he had taken from the adjacent corpses. While some elements of Zaitsev’s memoir need to be read with caution, there’s no doubting either his or the collective spirit of the city’s defenders whose superhuman efforts in every part of the city rapidly planted doubt in the minds of the previously invincible invaders. Wilhelm Hoffman of the Sixth Army’s 94th Infantry Division wrote in his diary: “The [grain] elevator is occupied not by men, but by devils that no flames or bullets can destroy… Wherever you look is fire and flame. There were more prolific snipers than Zaitsev (a soldier known only as “Zikan” accounted for 224 Germans by mid-November) but none captured the imagination of the defending forces and the Soviet people more completely. Stalin’s propagandists seized on this exponent of the new craze of “sniperism” both for its obvious boost to morale and the fact that in the enclosed, bombed-out surroundings of Stalingrad where German tanks could not pass, an expert marksman could exert a disproportionate influence. To soldiers who felt powerless before a better-equipped and relentlessly successful foe, the feats of a single man with a simple gun carried a potent, invigorating hope. Zaitsev’s memoir is a pungent, earthy account of the reality of close-quarter combat, which emphasises the cunning and endurance of men existing on flasks of hot kasha (porridge) and meagre rations of makharka (cheap tobacco). From details such as the Russian password, doroga meaning “make way” (chosen because no German could pronounce it properly), to the technique of tracking enemy movements by putting a shovel in the ground and placing one’s ear to the handle, it testifies to the daily realities of a titanic struggle fought amid a pulverisingly confined arena. Above all, it shows an understandable, but all-consuming hatred of the “Fritzes”. “I have a passion for observing enemy behaviour,” recalls Zaitsev. Zaitsev’s success soon saw him responsible for training other snipers, who became known as “leverets”, a play on the meaning of his surname, which translates as “hare”. As well as being deadly accurate, successful snipers needed to be masters of patience and camouflage, skilled in matters of decoy and subtle feints. Other snipers achieved fame beyond Stalingrad. The 20-year-old Anatoly Chekhov gained a reputation for fearlessness, along with an ability to improvise a device to conceal muzzle flash. He took Vasily Grossman, the war correspondent who later wrote an epic account of Stalingrad in his novel Life and Fate, along with him on one expedition where he shot a German ration carrier and then picked off two further men sent to complete the task. German forces soon employed Russian civilians, including children, to make these hazardous runs through the ruins. Under orders, they too met the same fate at the hands of snipers. While the German failure to capture Moscow the previous winter had signalled the first weakness in the Wehrmacht, its utter annihilation at Stalingrad left no room for recovery and determined the war’s final outcome. German soldiers familiar with the notion of Götterdämmerung from Wagner’s opera had seen it brought to life amid the end-of-days destruction of Stalingrad, which would, in turn, be replicated in Berlin. Two years on from that freezing Christmas of 1942, the Red Army was closing fast on the German capital. Here, according to historian Antony Beevor, a gallows humour prevailed. In anticipation of their traditionally beloved Christmas, Berliners joked about the ideal Yuletide present. Vasily Zaitsev’s story achieved wider recognition in 2001 through the Jean-Jacques Annaud film Enemy at the Gates, pictured below, which portrays a ‘duel’ in Stalingrad between Zaitsev (Jude Law) and German Erwin König (Ed Harris). The film is in the biographical tradition of Howard Hawks’ Oscar winner, Sergeant York (1941) which saw Gary Cooper cast as the sharp-shooting pacifist backwoodsman turned First World War hero. There’s even a nod in the direction of Fred Zinnemann’s The Day of the Jackal, where Edward Fox’s assassin pursues President Charles de Gaulle with military precision. And while that film took a 1962 assassination attempt on De Gaulle as the point of departure for a wholly fictional story, there are suggestions that Enemy at the Gates is a comparable mix of fact and fantasy. The source material was the novel War of the Rats by David Robbins, which sees SS Colonel Heinz Thorvald sent from Berlin to eliminate Zaitsev. It’s easy to see why Annaud changed the background of his German sniper from SS to Wehrmacht, but there are doubts that the Nazis sent any special sniper to target Zaitsev. Antony Beevor in his exhaustive history Stalingrad finds no evidence in the Russian Defence Ministry archive to support claims that there was a duel, although the files contain extensive reports of sniper activity. spotting his foe beneath a piece of scrap metal.